Bellahill (our home) is situated in the quiet countryside of Ballycarry, located on the Causeway Coastal Route and only a 10 minute drive from two local tourist attractions – The Gobbins and Carrickfergus Castle. The famous weaver poet James Orr, depicts the beauty of the area in his poem, The Bellahill Tree and William James Hume describes the serenity of the valley in his folk song The Muttonburn Stream, which runs close by our home. Having inherited the hospitality gene, we have always enjoyed having friends and family round for dinner and taking them out for a spin in our VW camper. We recently realised our home was the perfect place do what we loving doing best – giving people good food and a good old fashioned fun time. Arlene is a passionate cookery tutor with 15 years experience teaching and demonstrating to people of all ages and abilities, all over the UK. The highlight of her career, included website filming with Jamie Oliver and X Factor contestants. 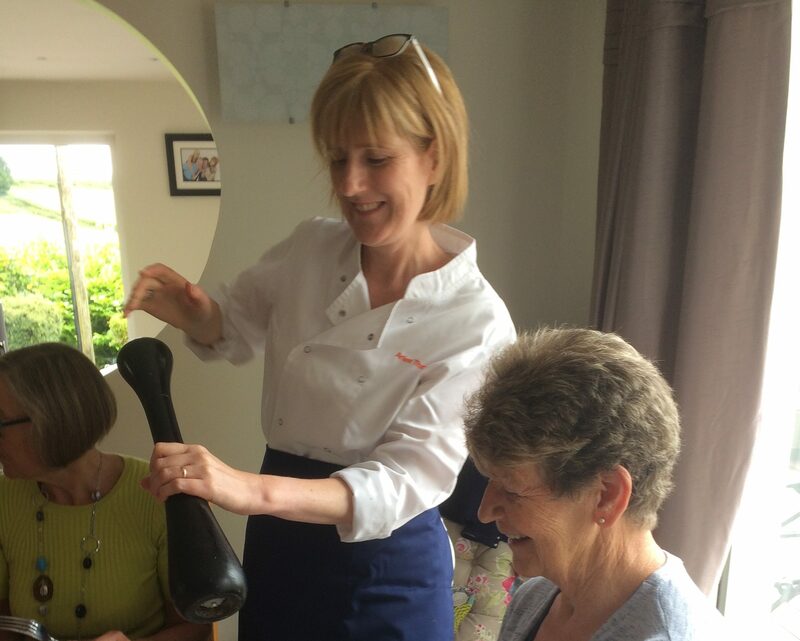 Her enthusiasm for good food and home cooking is infectious and her easy relaxed manner make her classes an inspirational experience, which she hopes you will pass on to your family and friends. Click here to find out more about our Bellahill Cookery experiences. Billy your VW campervan driver has a very outgoing and engaging personality. He is passionate about local history and traditions and has a very keen interest in anything vintage. This includes his beloved VW campervan (we call her Agnes). Agnes is our 1973 Type 2 Bay VW campervan and is decorated inside with vinyl records from the 70’s. She is a fully working camper and gives Billy and Arlene many carefree weekend breaks in sunny Portrush. A spin in Agnes will guarantee lots of friendly smiles, waves and beeps. We have endeavoured to preserve her raw charm and originality, which brings a nodding smile to everyone who meets her. She seats 6 adults (including the driver) and is available for chauffeur driven wedding hire.